When Samsung announced the first Galaxy Note smartphone last year, the device garnered two vastly different reactions. Some took one look and declared that is was too big to be a phone, poo-poohed how ridiculous people would look with it up to their ear, and complained that a person would need to use both hands – the horror! Others took one look and said: Finally. Here was a phone that had a screen big enough for reading web pages and eBooks comfortably, instead of just tolerably. And though the stylus may be old-fashioned, it turned out to be not so obsolete. 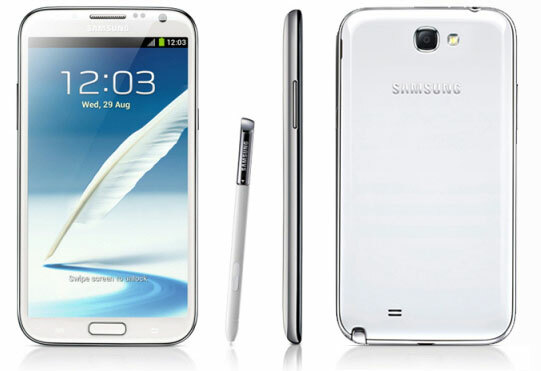 Samsung followed that successful phone up earlier this year, releasing the Galaxy Note II. This version has a slightly bigger screen, updated operating system, and a better pen experience. In many ways the Note II is an improvement on the first generation, though there are a few features I could do without. Still, this is the best big screen phone available on the US market so far. These are my impressions after using the device for several weeks. Note: The Verizon Wireless version of the Note II went on sale recently and this is the version I used for this review. If you thought that the first Galaxy Note was almost too big to be a phone, prepare yourself: the Note II is bigger. Samsung added an extra .2 inches to the display, bringing it up to 5.5 inches overall. Good news is that the overall size and weight are about the same. The bezel around the screen is a bit smaller and the corners even more rounded than before. The edges have a nice curve to them that makes the Note II comfortable to hold in one hand. That's important for a phone of this size. Using the Note II one-handed is still difficult, even with some of the enhancements on the software side. This phone is better for people who don't mind using two hands or who already do so. The design language here is in line with the Galaxy S III. The Note has a physical Home button plus capacitive Back and Menu buttons that you can't see unless the LEDs behind them light up. Though made from all plastic, the phone doesn't feel cheap. It's light at 6.3 ounces and well-balanced. The back cover comes off, so you have access to the battery, micro SD card slot, and SIM slot. The only other port is the micro USB on the bottom. There's no dedicated HDMI out, but the USB port is MHL-enabled, meaning you can attach a dongle for wired video connection to an HD TV or monitor. For all this bigness, does the Note II still feel like a phone? Yes, but just barely. Holding it up to an ear is a bit awkward at first, though I quickly got used to it. People who don't have long phone conversations or prefer headsets won't care. What matters is how it feels when you're looking at and interacting with the screen. Samsung hit the Goldilocks zone here with a design that minimizes the size and maximizes the holdability. With a screen this big, it needs to be the best. Otherwise, why bother? It's no surprise that the Super AMOLED display offers bright colors and deep blacks plus wide viewing angles and good visibility out in the sun. The 1280 x 720 pixel resolution isn't as dense the iPhone 5 (267 ppi vs 326 ppi) but still offers a nice HD viewing experience. Everything from text to hi-res video is crisp, even small elements. Why would you want a screen this big? It's geared toward people who like that tablets offer more screen real estate but don't want to carry both that and a phone. Whether you like to read eBooks or news feeds, play games, or just can't deal with tiny text on a tiny screen, the Note II is just big enough to work for people who prefer small 7-inch tablets. It's also a great phone for sharing video thanks to the screen. A small speaker in back manages pretty loud volume, so you can share videos even in semi-noisy rooms. The audio quality from these speakers is average for a phone. Plug in earbuds and it gets better; same goes for Bluetooth audio. The other standout feature of the Galaxy Note II is the S-Pen. Samsung doesn't want you to call it a stylus because it does more than just mimic the press of a finger. This version of the pen and the technology behind it adds a few more tricks, such as increasing the distance at which the screen can detect the S-Pen. This has two consequences: better palm rejection and the ability to hover over elements of the interface. This hovering capability is quite nice, especially on web pages with menus that require hovering to work. Samsung built some hover tricks into the interface, so it's possible to hover near the top or bottom of the screen to scroll up and down or see the labels on buttons before you tap. Some of these hover capabilities only work in Samsung apps (such as in Email but not in Gmail), though many work anywhere. You don't need the S-Pen to use the Note II. It does make some things much easier, such as clicking tiny links on the web or writing out notes. Samsung even provides gestures so you don't need to use the Back or Menu buttons. And with the squared shape, this S-Pen both easier to hold than the last generation and less likely to roll away. If you never take the S-Pen from the port, you won't miss it at all. But, once you start using it, you may find it hard to live without. The Verizon Wireless variant of the Note II was the last to hit the market and it is worth the wait. This carrier's 4G LTE speeds are still impressive even though the network in New York City (where we did most of our testing) is more crowded now than when the first LTE phones came along. I saw blazing speed when browsing the web, downloading apps, and streaming video. Call quality is average for smartphones. Caller's voices are clear in the earpiece and they reported the same on their end. Since this is such a big phone I usually opted for a wired or Bluetooth headset. In both instances the audio quality remained good. I never experienced dropped calls. The only complaint I have about the Verizon version versus any of the others – this smartphone is available on AT&T, Sprint, T-Mobile, and U.S. Cellular – is that there are a few missing software features. Verizon has a history of doing this for no good reason (they disabled the Galaxy S III's AllShare cast capability, for instance) and have provided no viable reason for the omissions. They're minor – the absence of a Wi-Fi toggle in the notification drawer, some missing widgets, etc. -- but do point to an odd propensity to take away features that other carriers don't demonstrate. It's something to consider. The 8 megapixel camera on the back of the Note II is the same quality as the one on the Galaxy S III. Outdoor shots are filled with color and crisp, but pictures shot indoors aren't that impressive. The HTC One X remains the favored Android shooter since it can produce more detail and handle low light much better than the Note. Still, I do like that Samsung packs the camera app with a ton of settings that allow even novice photographers the tools they need to improve shots. I particularly like that users can edit which shortcuts are on the main screen. That way you have quick access to your favorite settings. The same photo enhancing and sharing features found on the GS III are on the Note II as well. This includes Buddy Share, Best Photo, Best Face, and Share Shot. The Best Photo and Best Face modes allow you to take several pictures in quick succession and either choose the best shot of many or choose the best face in a group shot. Even if the best faces for each individual exist in different shots, the Note will meld them all into one great picture. These features are useful because of the type of pictures you'll likely to take with the phone. The sharing features are nice, but are sometimes too complex to set up and require others to have Samsung smartphones, which is less useful. The Note II ships with Android 4.1 Jelly Bean. As with all of their other smartphones, Samsung adds their own interface to Android. This "skin" is called TouchWiz, and it has both good and bad points. At its best, TouchWiz makes using Android easier and provides nice extras, such as time-saving gestures, widgets, and handy toggles in the Notification drawer (if Verizon lets you keep them, anyway...). However, sometimes it gets in the way. For instance, TouchWiz changes the way you add widgets to Home screens and how you uninstall apps from how you'd perform these actions in stock Android. It also changes the way users access the Google Now feature. These modifications might not be annoying if they were done for a better user experience. Instead, it's just confusing. Still, the good outweighs the bad overall. Thanks to the quad-core processor and 2GB of RAM inside, the Note II handles all of this even better than the GSIII. Interacting with the phone is fast and smooth, from opening apps to writing on screen with the S-Pen. All versions of the Galaxy Note II come with 16GB of internal storage. The microSD card slot takes cards up to 64GB. Verizon Wireless' 4G LTE is a notorious battery hog, but it looks like the Note II's 3100mAh battery is more than capable of handling it. I used the phone heavily for several days and regularly got 13 – 15 hours of battery with 15% or more juice left over. This is without any battery saving tweaks. For people who see the appeal of a big screen smartphone, the Galaxy Note II is one of the best specimens of the type available today. The closest competition is the LG Optimus Vu/Intuition, which is too inelegant and blocky to compete with the Note on design and looks. HTC's Droid DNA comes close with a design that feels more phone-like and a far denser display, but can't match Samsung on performance or battery life. The Note II has everything you'd expect from good phones, including speedy performance on a fast network, a great display, and a decent (if not spectacular) camera. To all this it adds something more substantial in the inclusion of the S-Pen and the improved functionality there. If you want something that can honestly take the place of a smaller tablet yet still work as a phone, the Note II is an excellent choice. However, if big phones aren't your thing, the Note won't change your mind about that. This isn't the phone for everyone. But for the audience it's aimed at, the Samsung Galaxy Note II is a top pick.